خواجه پیری, مهدیه. (1391). احیای فرهنگ و سنت در منظر معاصر هند؛ تحلیل شیوه معاصر منظرسازی محمد شهیر. مجله علمی-ترویجی منظر, 4(19), 38-45. مهدیه خواجه پیری. "احیای فرهنگ و سنت در منظر معاصر هند؛ تحلیل شیوه معاصر منظرسازی محمد شهیر". 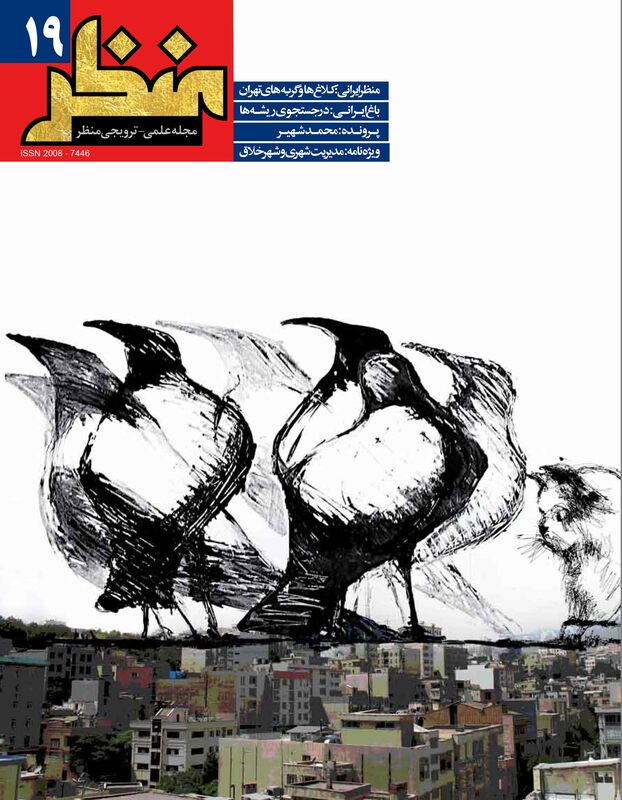 مجله علمی-ترویجی منظر, 4, 19, 1391, 38-45. خواجه پیری, مهدیه. (1391). 'احیای فرهنگ و سنت در منظر معاصر هند؛ تحلیل شیوه معاصر منظرسازی محمد شهیر', مجله علمی-ترویجی منظر, 4(19), pp. 38-45. خواجه پیری, مهدیه. احیای فرهنگ و سنت در منظر معاصر هند؛ تحلیل شیوه معاصر منظرسازی محمد شهیر. مجله علمی-ترویجی منظر, 1391; 4(19): 38-45. سازگاری و تعامل گروه‌های گوناگون فرهنگی و آیینی در هند سبب تنوع شخصیتی و پدیداری فرهنگ و هویتی ترکیبی برای این شبه قاره شده است. تنوع اجتماعی، اقتصادی و به‌خصوص تنوع فرهنگی و عدم مدیریت آن و همچنین توسعه صنعتی و تکنولوژیک، هند را با بحران هویت در ابعاد مختلف و از جمله در فضاها، فرم‌های زیستی و شهرهای کلان مواجه کرده است. در کنار این، استعمار و به ‌دنبال آن نفوذ شهرسازی و معماری غربی نیز بر بی‌هویتی شهرهای هند دامن زد به‌طوری که امروز جنبه‌های فرهنگی و انطباق اقلیمی در طراحی‌های معماری فراموش شده است. در چنین شرایطی پارک‌ها و فضاهای سبز هند با الگوهای انگلیسی ساخته می‌شدند. این پروژه‌ها به‌جای طرح منظرین، صرفاً پروژهای باغبانی بودند که بی‌ارتباط با محیط پیرامون طراحی می‌شدند. در این دوران نقش نسل نخست معماران و معماران منظر هندی فارغ‌التحصیل دانشگاه‌های بین‌المللی در بازیافتن و نقش دادن به هویت هندی در حرکت رو به توسعه و پیشرفت کشور هند تعیین‌کننده بود. محمد شهیر نمونۀ موفق معمار منظر هندی، با توجه بیشتر به سایت‌های تاریخی و بازسازی آنها، اصول برآمده از معماری سنتی هند را با زندگی امروز و شرایط فرهنگی آن تلفیق کرد و ترکیبی موفق از سنتی و مدرن در فضاهای شهری را پدید آورد و توانست با طیف وسیع پروژه‌های منظرین، فرهنگ هندی را برای بازدیدکنندگان به نمایش بگذارد. در این نوشتار پس از مروری بر روند تحولات معماری منظر هند قبل و بعد از استقلال و نسبت آن با هویت و فرهنگ هندی، به رویکرد هویت‌گرای محمد شهیر در این حوزه به‌خصوص در پروژه‌های بنای یادبود راجیو گاندی "Vir Bhumi"، باغ موزه "Sanskriti Foundation" و میدان شهری چوک "Chowk-Town Square" پرداخته خواهد شد. M.A. in Landscape Architecture, School of Planning and Architecture, New Delhi, India. The coexistence of people with different ethnic and religious affiliations in India has led to the emergence of diverse identities and mixed cultures in the country throughout history. India is currently facing an identity crisis considering the differences between people in terms of economic conditions, social status as well as religious background. What is already deteriorating this identity crisis is the inability of the government to find for ways to bridge the gaps between people in different levels. India’s modern status as an industrialized country has also played a crucial factor in deteriorating the country’s identity crisis which is clearly visible in different aspects, particularly with regards to the designing of urban spaces of cities. Additionally, India has taken influence from Western architecture as the result of years of colonialism. This is generally believed to have contributed to the country’s identity crisis in such a way that the indigenous aspects of Indian architecture is today missing in the country’s urban structures. What is visible instead is urban spaces like parks which have been built based on British designs. Those urban spaces were basically void from any specific landscape value and were mostly garden projects which were built regardless to the characteristics of their surrounding environments. Accordingly, the role of the first generation of Indian architects graduated from international universities was significant in reviving the Indian identity particularly at a time that the country was already moving on the path of development. Mohammad Shaheer is a renowned pioneer of contemporary Indian landscape architecture who has been engaged in studying and restoring the country’s historical sites. Shaheer has been able to combine the principles of traditional Indian architecture with modern cultural elements to introduce a successful mix for building urban areas which best displays the Indian culture. The present article studies developments in India’s architecture before and after colonialism and looks into their relations to the Indian culture and identity. It will then scrutinize Mohammad Shaheer’s identity-based approach in designing the architecture of important national sites like Vir Bhumi, Sanskriti Foundation and Chowk-Town Square.